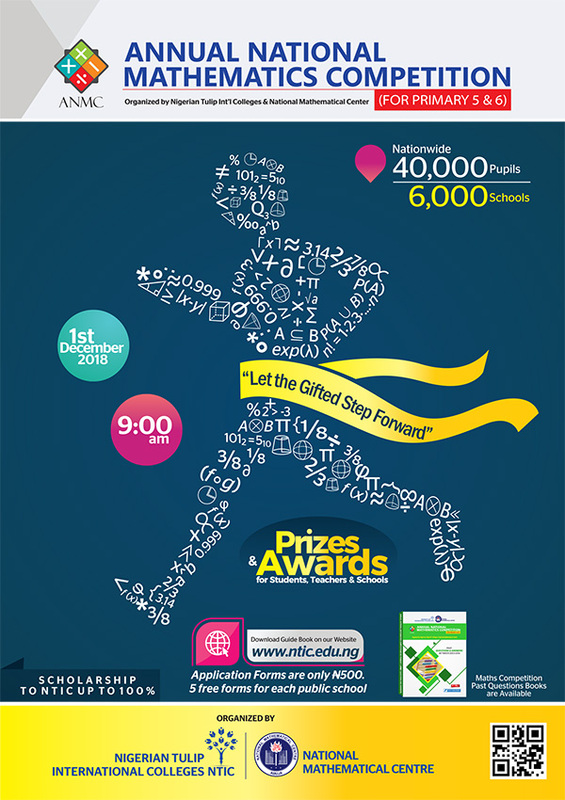 NTIC & NMC 16th Edition Annual National Mathematics Competition [ANMC] Registration Procedures, Dates and Venues for the First and Second Stages and Prizes and Award Ceremony for Primary 5&6 Students, Teachers and Schools for 2019/2020 Session. We are pleased to inform you about the upcoming traditional feast of mathematics for pupils, teachers and parents. It is the 16th edition of Annual National Mathematics Competition for Primary 5&6 pupils organized by two of the leading institutions of Nigeria in the area of education: Nigerian Tulip International Colleges (NTIC) and National Mathematical Center (NMC). NTIC and NMC are putting a great effort to seed the love of mathematics in pupils’ hearts. However, they are not the only ones who have branded this excellent product; we owe thousands of pupils, teachers and parents all around Nigeria who are contributing to this festival with their efforts and enthusiasm. It is worth reminding you that this competition is only for primary 5&6 pupils from public or private primary schools all around Nigeria. Age limit is 12years old. All students are to sit for the exam in states where their schools are registered. examination involving 75 questions distributed as follows; 35 algebra, 15 geometry and 25 aptitude. The questions are prepared according to Nigerian Primary school syllabus but in a harder level. Duration of the examination: A total of 120 minutes allotted to answer all the questions. The first stage of the annual competition holds simultaneously in 36 states of the federation including FCT. All primary 5&6 pupils from public or private primary schools may participate in this competition. There is no limitation to the number of students who can participate in the exam in a school. Each participant must come with a copy of the Examination Card filled out completely to the exam hall (a detached copy from the registration form sold by NTIC and NMC officers or other responsible people from schools or ministries procured at N500). The best 5 pupils (academic excellence) from each public school can access the examination registration form without any payment. Public schools are to decide their 5 best pupils for free entry for the competition. Students are expected to come for the exam in their school uniforms. You can get detail of the venues for the exam from any of our school branches or you may contact an officer from NMC and Ministries of Education across states or click here. Students will be asked to shade the necessary information and their answers into answer sheets that will be provided for them at the exam centre using pencils only. Since the answer sheets are in optic format, the pupils may not be used to shading the answers and the necessary information properly. That is why we request the assistance of the teachers and the parents in teaching them how to shade into the optic forms properly. The reason for using the uncommon optic forms is to be able to mark the sheets and deliver the results within the shortest time despite the fact that over 33,000 pupils are participating in this competition. We expect to finalize the marking of the scripts within two weeks after the first stage. Please note that the results will ONLY be announced on the official website of the school (www.ntic.edu.ng). Based on the results, each state will produce five (5) winners who would qualify for the final round of the exam. The results for each state will be published on the website 14 days after the state level. Each state with no more than 2999 participants will produce 5 qualifiers for 2nd stage with highest scores. States with participants from 3000 to 4999 will produce 7 qualifiers for 2nd stage with highest scores. States with more than 5000 participant will produce 10 qualifiers for 2nd stage with highest scores. The 5 winners of each state will be invited to the final stage. Although the winners will be given calls (on the number provided in the examination form) to be informed about the final stage, it is the winners’ responsibility to check and learn about the results on time from our website. In the case where a winner does not come for the final stage for whatsoever reason, he/she cannot claim to proceed to the final stage. But he/she still will be awarded his deserved award gotten from the first stage. All qualified students for second stage are to bring birth certificate and letter of identification from their school. Each pupil is expected to be accompanied by one teacher. If two or more pupils come from the same school, only one teacher must accompany them. If parents or more teachers want to come to the event, they have to provide their own accommodation and transportation fare. Each pupil and their trainers will be awarded according to the award table below. The accommodation and public transport (by road) fee (to and fro) for each winner student and only one teacher from the winner school will be paid. The award giving ceremony for the first stage (state level) will hold on the same day of arrival to the center states. (-). Only the winners of the state level will sit for the final stage examination the following morning (-). They will have 120 minutes for 75 objective questions. 1. The best five pupils from each state will receive an invitation to participate at the zonal level. 2. 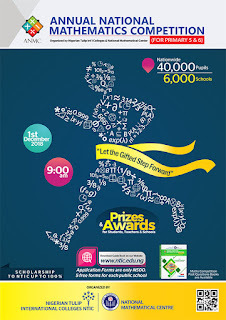 The best five pupils from each state will be awarded with N15000, N10000, N10000, N5000, N5000 cash, respectively. 6. The best five pupils from each state will be honored with certificates of merit. 7. The schools and teachers of best five pupils from each state will be awarded with certificates of merit. 8. The schools of the best five pupils from each state will receive plaques. 9. The teachers of the best five pupils from each state will be awarded with N15000, N10000, N10000, N5000, N5000 cash, respectively. 1. 3 gold, 4 silver and 5 bronze medals will be given in each zone. 3. The pupils from 8th to 12th position from each zone will get a 100% scholarship of tuition. 4. The best twelve pupils from each zone will receive a cash prize as indicated below. 5. The teachers of the best twelve pupils from each zone will receive a cash prize as stated below. 6. The best three schools from each zone will be given special prizes. 7. The best twelve pupils from each zone will be given certificates of merit. 8. The schools and teachers of the best twelve pupils from each zone will be awarded certificates of merit. 9. The schools of the best twelve pupils from each zone will be awarded plaques. 10.Gauss Awards will be given to the best schools as explained in the next section. Scholarships are available only for Nigerian Tulip International Colleges. The schools with the highest number of “excellent” grades at the state level in each zone will be awarded by Gauss Awards. In case of equality, the organizer is to decide on one of the schools putting into consideration the number of students who participated from the candidate school, the average and the general performance of their student’s performance. Excellence degree will be given to all students who obtain a score (see “how to calculate the score”) of 90 or more. Promising degree will be given to those who obtain a score between 85 and 90. The organizers reserve the right to change or add to the rules and regulations if such addition or changes are required. A, G, and Apt represent the number of correct answers of the participant in Algebra, Geometry and Aptitude, respectively. That means, the number of correct answers in Algebra, Geometry and Aptitude are multiplied by the coefficients of the section and then added together to obtain the Rough Score. For fast and correct results, the pupils are expected to shade properly. From experience, we have observed that most, pupils are not be used to shading optic forms. Even after being instructed by their invigilators on proper shading, many of them still shade wrongly. This challenge has been responsible for delays in releasing of result. For this reason, in this edition, we are going to use an improved version of the optic forms that will enable us to mark and release the results as soon as possible. However, we still request the help of teachers and parents to teach pupils how to shade properly before coming for the exam. You will see a SAMPLE of proper shading on optic form. Teachers and parents are requested to train the pupils about how to shade properly. In case of wrong shading, we do not assume any responsibility. The pupils will get the results according to how they shaded. Note that, if a pupil shades more than one answer in a line, his answer will be regarded as a wrong answer. In case, he changes his mind about one of his answers, he should erase the previous one completely by using a soft eraser before marking the new choice. • they do not make proper shading.